No biography is about its author, but writing about anything, and especially biography, requires the writer engage deeply. This means not that she writes personally but that she bring to her books her questions about living. These include her curiosity about how and why people change or how and why they get stuck; her fears about being trapped, or being free, her loves – of books, of certain kinds of people, of certain professions, of travel, of causes. What fascinates me are people who escape their narrow, prosperous beginnings to lead lives committed to social justice. I am drawn to stories of increasing freedom, rather than stories of the power of fear. I also like people who love books and reading, because I do too. And I am especially fascinated when people expect and allow ideas to change their lives. This effort to engage deeply, however, brings with it a challenge: when my subject goes off into aspects of life that I are not drawn to, or do not find fascinating, that is exactly when I must apply all my biographical skills the most intently. For in the end the book is about my subject, and my responsibility is to follow her wherever she takes me, no matter how strange a place it feels to me. If she is a pacifist, and I am not, then I had better dive deeply into the how and why she rejected war as the solution to international disputes. If she is a Southerner and I am a Northerner, than I had better study her love of the South closely, to be sure I can capture how she felt. Ralph Waldo Emerson, author of the quote above, was gifted at such efforts. His broad imagination took him into Hinduism and other subjects unfamiliar to mid-nineteenth-century Protestant Americans. He was eager to learn from every culture because he believed he held the universe inside himself and that every human being did as well. It is a great goal for any writer to aim for – to find ways to write that are open-hearted to all viewpoints and honest about facing the truth. Jane Addams and Sarah and Angelina Grimke were women whose lives and choices I am drawn to and, at the same time, their lives challenge me to stretch my own imagination and the frontiers of my own knowledge. This book covers Addams's life from birth to age 40. My goal was to understand her formative years, how she became the leader she became. Not surprisingly, it was a process of adding to and subtracting from her core beliefs -- about human nature, about people of other classes and races, about where her first duties (she was a 19th century woman after all) lay. She flourished in a privileged "given life" in a wealthy family in a small town but in the end she embraced a new "chosen life" in the industrial city of Chicago, living among working people, mostly immigrants, and, her inheritance spent, earning her own living as a speaker and writer. The second half of the book covers her first ten years living at the settlement house she and a friend co-founded in Chicago, Hull House, and changing her mind about what it meant to believe in democracy. She had always loved the idea, but it was life at Hull House that taught her what trusting the people really meant. This book is a full-life biography. 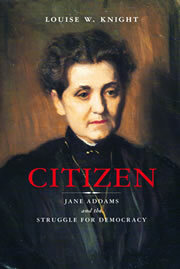 While it draws on the insights I gained from writing Citizen, it is all fresh writing, and carries the story across every decade of her life, from 1860 until her death in 1935. We see her wrestling with the politicization of politics, trying to find her footing during a painful dispute within the rising suffrage movement, and feeling compelled by her conscience to take an anguished stand for peace during time of war. In this book, the moral dilemmas created by aspiring to a Christian-infused integrity -- always under construction -- are highlighted. It focuses on her emergence as a political leader with a fierce democratic vision and shows what she was able to accomplish in collaboration with many allies and the price she paid for her commitments. Those looking for a short introduction to her full life. will want to read this book. It was written because so many people do not know the story. It is the first full-life biography of Addams in 37 years.